John Comments: Sentient killer smog in Los Angeles of course requires occult defense. Only in the 80s. Computers became much easier to use once the three different coloured keypads evolved into the QUERTY keyboard we know today. That machine screams ‘early 80s’. It’s not a PC: it’s a PET, coloured keyboard and all (though the areas covered by the different colours are wrong). Didn’t that guy show up at the end of every Star Trek episode in the 60s? Nice to see he was still getting work as late as 1985. Also, Killus is a pretty badass name. He would be played by 80s Arnold Schwarzenegger in the inevitable action movie of his life. Is that the overworld map to the original Legend of Zelda on the computer monitor? It is! Because computer games are EEEEEEVILLL!!! 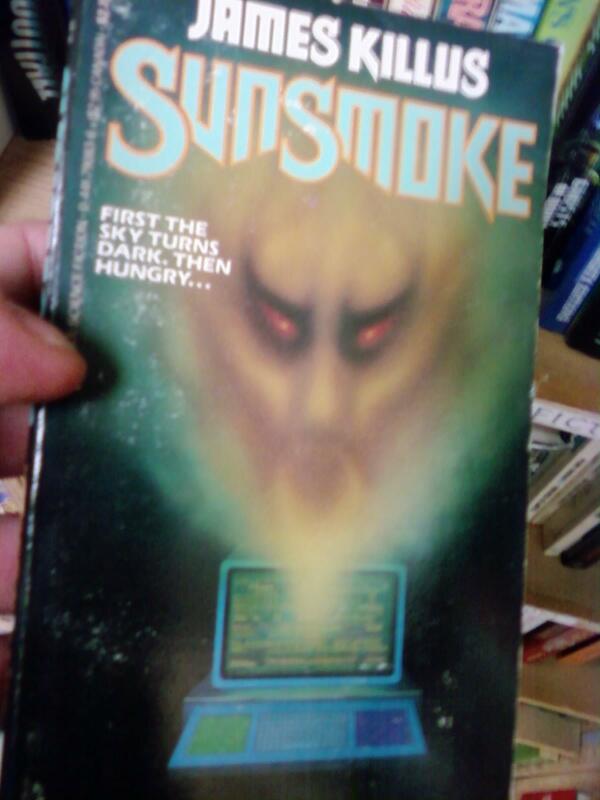 I will grudgingly concede that Sunsmoke is a better title than Evil Brown Laptop Fart. Unless it’s a misprint for Gunsmoke. In which case it’s a much worse title. The way the smoke is drawn gives it a bit of that Fu Manchu / Ming the Merciless look … hmm, there may be some relation to the 80’s Max Von Sydow Ming. Surely that’s just a quote for your average saturday out. First the sky turns dark, as you drink in your local from 3pm.. then you get hungry and slip off for a kebab. As for the “possessed computer” image itself, isn’t it a “knock off” of the poster art of the early 80’s Video, Evilspeak…? (The art work, for said movie, had a possessed Apple II Personal Computer, projecting a pentagram into the air, as I recall…). Protip: do NOT ask ‘Am I pursued by an air elemental?’ on Yahoo!Answers. Did the System Lord Sokar just project himself out of that laptop? Because seriously, that’s who that looks like.